You may have at one point asked yourself: I’ve rarely ever used by boomvang, do I really need it? The obvious answer is yes, but do you really know more than just the short answer as to why? Absolutely! The boom vang can be a misunderstood sail control. It takes over the job of pulling down on the boom once the mainsheet is eased. Upwind, the mainsheet pulls down as soon as the boom is over the traveler. 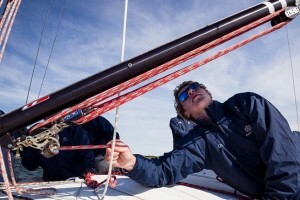 Controlling the boom height determines twist, or the shape of the mainsail leech. If you don’t use the boom vang in all but the lightest conditions, the boom will rise up as it is eased out and the sail will twist off, spilling power out of the top of the sail. This is okay when you have too much heel and helm, but not when you need power. Not taking advantage of your boom vang also limits how far out you can ease the sail. If the top is twisted off, it will run up against the upper shrouds and wrap itself around the stay, which prevents you from letting out the sail as far as you would like. The golden rule of thumb: Use enough vang to keep the top batten parallel to the boom. If it is too tight, the top telltale will stall. There are a few exceptions however when it comes to boom vang use. The first has to do with multihull boats, which have a traveler that runs the entire width of the boat. With this type of boat, letting the traveler down allows the mainsheet to continue to do the job of pulling down and controlling twist. The length of the traveler lets the boom go a long way out before it starts to lift. Also, most multihulls have upper shrouds that are quite far aft, which prevents easing the mainsheet very far. A vang still helps, however, as it allows maximum ease on the boom before the shrouds become an issue. The other exception has to do with high-performance planing boats that use asymmetrical spinnakers (Melges 24s, 32s, and C&C 30s, etc). To promote planing and to match the leech of the asymmetrical spinnaker when reaching high angles, a huge amount of twist is required. With this type of boat, you have to ease the vang (until it is almost off) to induce twist, then overshoot and pump the mainsail to promote planing.